The weight has been kept down to a class record of 175 kg. V60 MAGNESIUM + ENGINE: EVEN MORE POWERFUL. The twin-cylinder V60 Magnesium has been further enhanced and renamed the “V 60Â¯ Magnesium +” due to its superior technological content. Its power has been further increased thus improving the already excellent performance of the “V 60Â¯ Magnesium”. It has been brought up to 104 kW at 10,000 rpm through a series of modifications aimed at refining the vital engine components. Its weight has been reduced to a minimum thanks to the widespread use of noble metals such as magnesium for the head and clutch covers, and titanium for the screws and bolts.The intake ducts are perfectly coupled to the 57 mm throttle bodies thanks to sophisticated CNC machining. New pistons, with molybdenum disulphide surfacing, reduce friction losses to a minimum, thus actively contributing towards reaching a higher maximum power. The engine oil tank is made of stainless steel. The distinctive features of this high-tech engine of course remain unchanged, such as the Air Runner ramming intake, Anti Vibration Double Countershaft (AVDC) and anti-bounce PPC clutch. In accordance with the Aprilia tradition, the twin-spar frame is made of cast aluminium-silicon alloy and die cast Peraluman 450 parts. It is extremely light, weighing only 9650 g. The entirely robot-assembled swing arm is made of Peraluman and cast AlSi7 and has a “double banana” shape so that the two-silencer exhaust unit may pass through. The swing arm too sets a new weight record at only 4860 g. The exclusive “Titanium gold” colour underlines the exclusiveness of RSV 1000 R Nera design. 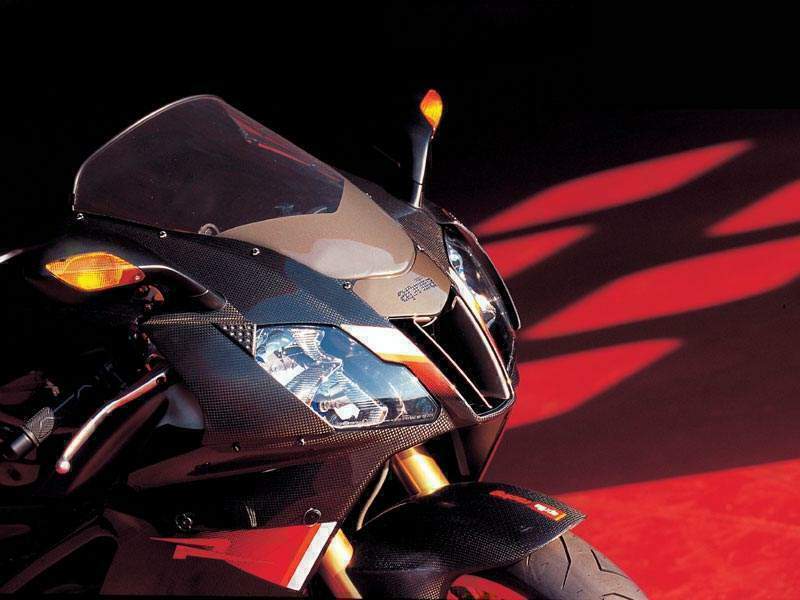 The RSV 1000 R Nera is fitted with the world’s best components. The upside-down fork and shock absorber are Öhlins Racing, as is the adjustable steering damper fitted in a radial position. The upper steering plate is made of Anticorodal with CNC machining and the ignition block may be disassembled. A plate shows the limited edition bike number (1- 200). All the components are held in place with titanium nuts and bolts. The headstock is made of extremely high-tensile aluminium, which contributes towards keeping the weight of the bike down. 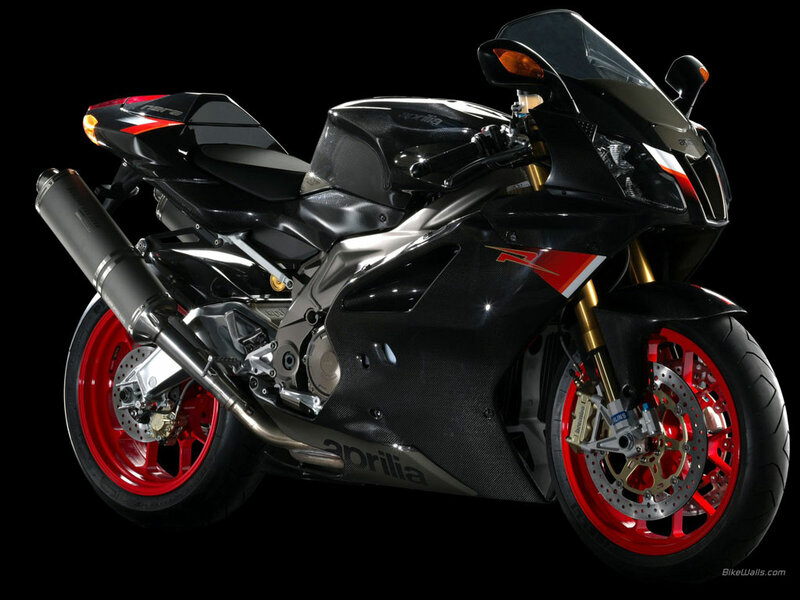 The front radial-calliper braking system, developed by Aprilia in partnership with Brembo, is the present state of the art among systems for supersport road bikes. The 320 mm front floating steel discs use lowered mounts to minimize weight and inertia, leading to more effective handling. The radial system on the RSV 1000 R Nera is combined with a radial pump to form the most sophisticated braking system currently fitted to a production bike. Another component that contributes towards making the RSV 1000 Nera unique is the superlight wheels made of forged magnesium, which thanks to a special coating ensure maximum resistance to corrosion. This is the first time this type of wheel has been used on a production bike. The wheel nuts and bolts are made entirely of titanium. All this makes the wheels an overall 1.9 kg lighter than the forged aluminium wheels used on the RSV 1000 R Factory. 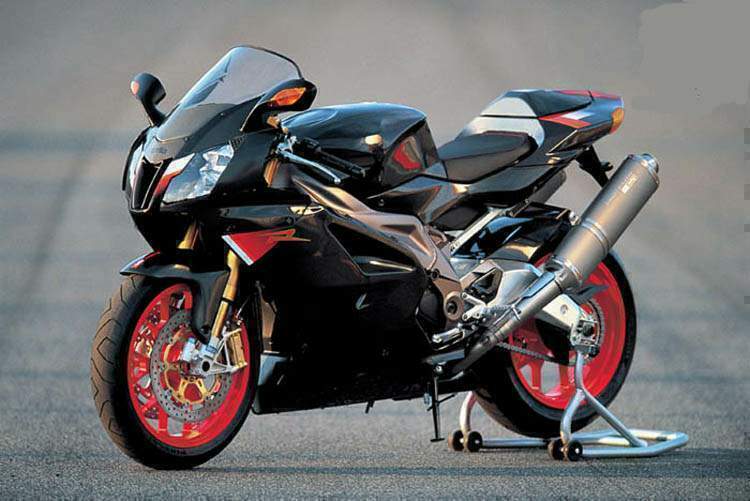 The RSV 1000 R Nera exhaust system derives from experience acquired in the Superbike championships. The 2 in 1 in 2 arrangement provides the best aerodynamic penetration and is optimum for balancing the bike on its centre line. The system is fitted with a catalytic converter and lambda sensor which drastically reduce the emission of pollutants to well under the Euro 2 limits. The silencer is coated with 8/10 mm thick titanium and fitted with clamps and rivets as it is in typical hand-assembled racing systems. 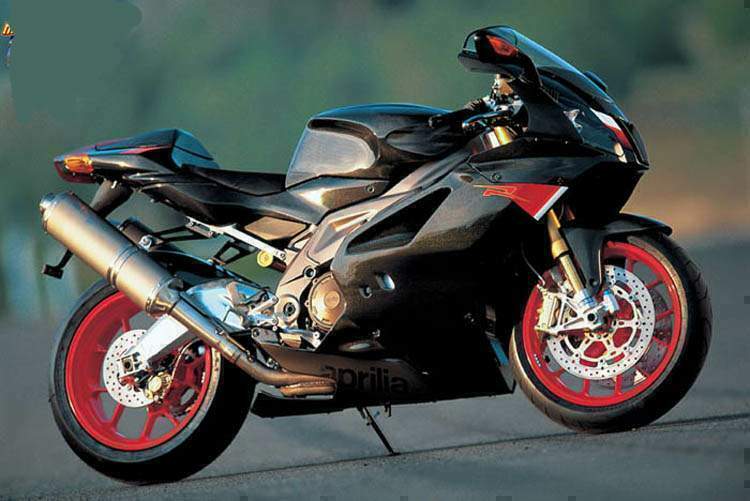 The bike exhaust system also comes as standard with Akrapovic Aprilia Racing manifolds which further increase the bike’s performance on the track. The RSV 1000 R Nera marks the beginning of an ambitious commercial project where a limited edition bike is sold together with a packet of benefits made to measure for each buyer. The aim is not, or not just, to sell the customer a bike, but to offer him/her a whole world of reference: an experience which starts with direct purchasing from the manufacturer through a set of devoted channels and ends up with special events connected with the purchase. 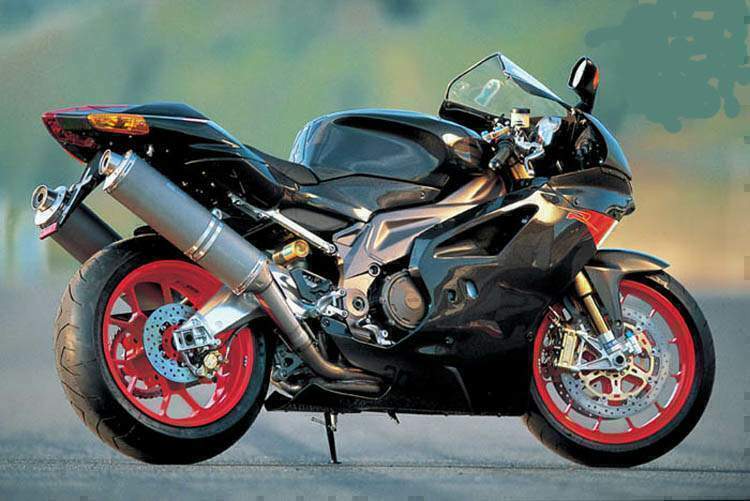 The launch of the RSV 1000 R Nera pilot project involves putting one of the first bikes made up for auction on eBay. The proceeds will go entirely to non-profit organizations linked to the world of motorcycling. Right from the moment they buy it, each owner of this exclusive bike will be “pampered” by Aprilia and lavished with a thousand attentions: a weekend at the track as a special guest of the Racing Team during a MotoGP meeting - at the nearest location to the customer’s residence - with an official Aprilia Racing uniform, paddock pass, memorabilia and many other surprises.